As of April 10, 2018, Google has deprecated the Google Cloud Messaging (GCM) service. The GCM server and client APIs are deprecated and will be removed as of April 11, 2019. Migrate GCM apps to Firebase Cloud Messaging (FCM), which inherits the reliable and scalable GCM infrastructure, plus many new features. The Mattermost Push Notification Service version 5.8+ uses FCM to send Push notifications for Android. 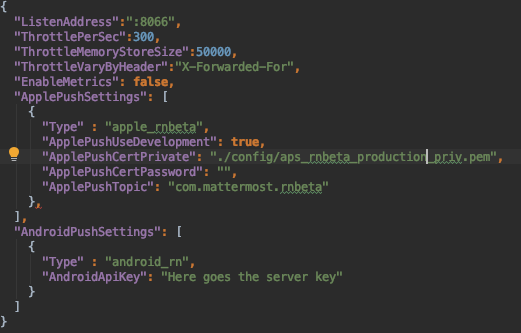 Open the mattermost-push-proxy.json file in the mattermost-push-proxy/config directory and replace the value for the “AndroidApiKey” setting with the Server Key you just copied. Restart your Mattermost Push Notification Service, and notifications should be sent using FCM. Test push notifications are being delivered as expected. Cannot send push notifications through FCM, connection refused or timeout.